Ever wonder how a fight goes around here? Pretty much like this. But does Todd really wear that blue eye shadow? I'm more of a rouge man. That episode played here in Australia just on Monday. 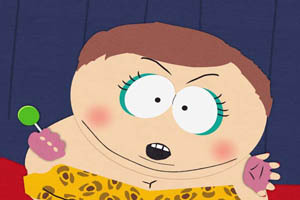 Now I have only seen a few eps of South Park but the scene on the talk show- whateva- was just hilarious! Lol, Cartman was so funny in that scene!